A LOT of what goes on here is word of mouth – where to get this, who to talk to about that, how to get there etc. There is a sort-of Falklands “it is known” mentality; people just ‘know’. We’ve been starting to tap into this but have barely scratched the surface. We’d heard that Cape Dolphin was well worth a visit and a quick consultation of my highly out-of-date but only option maps told us it was about 2 hours’ drive on ‘the North camp road’ so we headed out there, passing by the quaint settlement of Teal Inlet where the British forces stopped off on their famous Yomp. True to form of the Falklands being behind the UK by several decades, there is no right to roam here so we paid the land access fee of £15 each (bit steep but unavoidable). This gave us directions down an 8-mile off-road track to the most Northerly point on East Falkland. This was a taxing drive for the novice off-roader (those of you on WhatsApp can ask Han for a few seconds of Dashcam footage) but did confirm that we made the correct choice in car with the Hilux Surf! The beast proved its worth today! At the end of the track, the peninsular opens out to a large area of Tussac grass, common in the Falklands and growing up to 2m tall in places. Jurassic Park is always right: don’t go into the long grass! The minefields left by the Argentines are far less intimidating than the minefield-like combination of grass and sea lion. Han may have worked with dangerous dogs before, but she is NOT OK with wild sea lions. 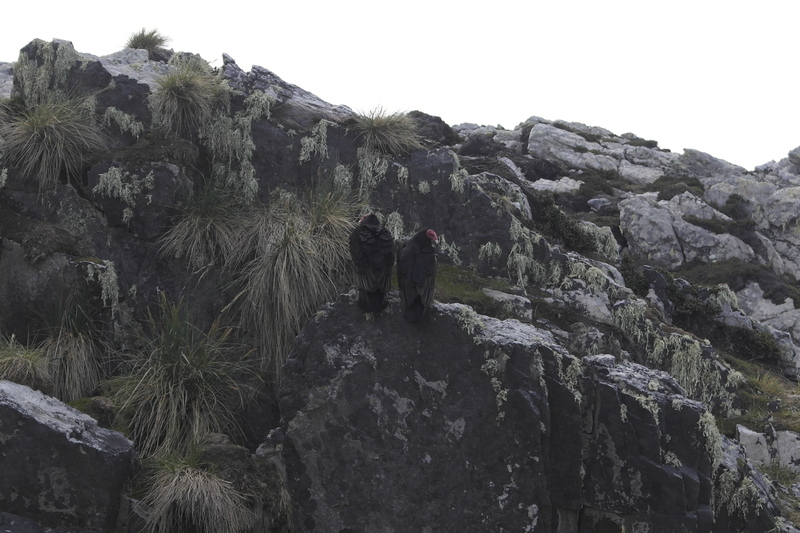 We did eventually, after a very slow and very tentative walk, reach a rock shelf where we were able to observe them from a safe-ish distance and another unforgettable day in the Falklands cemented itself into our memories. I call this one ‘fear, masked by a smile’. Sincerest apologies for the lack of update last weekend. Unless we stay up between midnight and 6am, when the internet here is free, it becomes difficult to upload photos. In Nick’s words we’ll “use up all our internet tokens”. We’re hoping to head out to a place called Cape Dolphin tomorrow by recommendation but what we’ll find there we’re not completely sure of so there may well be another update very soon. The view East from the lighthouse. Next stop, Africa! 1 – You may well have heard that, as of the early hours on Wednesday morning, a cruise ship fire and subsequent evacuation led to a minor emergency here in the Falkland Islands. 5 miles off of the coast of East Falklands a cruise ship heading for South Georgia (lucky buggers, I’ve been told it’s annoyingly impossible to get there from here) ran into trouble and required evacuation of all passengers. According to the Telegraph, this was an MoD operation and all was taken care of by them. The reality was that a substantial community operation was mounted with many being asked to donate clothing, house stranded passengers and generally care for those involved (https://www.facebook.com/Falkland-Islands-Government-639300059417658/?fref=nf). One telling statement on where we live is that a community of 2500 was asked to house 347 passengers and people offered their spare bedrooms up without question. Many, many stories of grateful passengers are floating about Stanley and my students coming to school with comments like “we have 4 chinese people staying with us”, “we’ve got 2 Dutch people, Mum gave them money to go to the shop as they didn’t have anything” and so on and so on catch me finding this place utterly remarkable. It made me wonder how many communities would have such a high percentage of people offer up help for strangers in the UK. Worth a thought! 2- A further epiphany occurred this week when I was asked, over the course of conversation by a Dutch friend, if “I missed my country”. It seems a simple question but it flagged up that, at no point of my being here, have I ever felt that I wasn’t in ‘my country’. I have not, since arriving, felt at all that I was in South America and have never felt that this place was anything but a British town. 8000 miles isn’t so noticeable after all, it seems. 3- I suspect that life here will bring a number of continuous revelations but this week this was brought home a little when a colleague suffered an injury whilst out on his motorbike (as mentioned before, most Falkland Islanders can ride them well off-road, including the children). This wouldn’t be that big a deal except that he did his knee in and has had to be flown back to the UK on an urgent flight for an unspecified amount of time for an MRI and potential operation. Things like that are a bit of a reminder that we are living in one of the most remote communities in the world. If something goes wrong, we’re facing a medi-evac to Chile or UK on not-so-regular flights. Another colleague informed me that, due to pregnancy complications, she had to take the 18 hour ‘airbridge’ flight to UK with a doctor and nurse and the plane had to fly low-level the entire way to minimise the pressure difference and avoid birth complications. That kind of isolation is a scary thought for someone as irresponsible and thrill-seeking as me. Still, it could be worse; I could live in Milton Keynes. My first post! I thought I’d better jump on the blogging bandwagon and get a post in there before Bailey gets too far ahead of me, not that we’re competitive. These are just 5 shots from the trip we went on yesterday. I still get excited every time I see a penguin. This little guy was all on his own playing around in the surf. 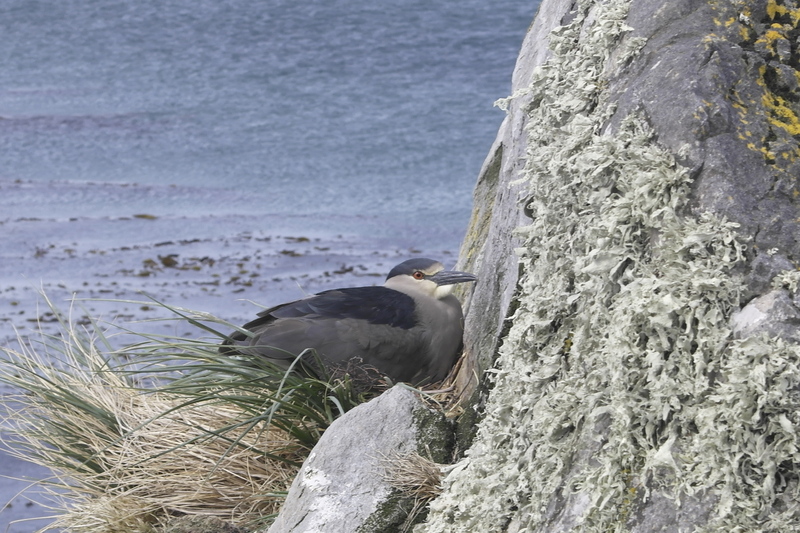 However we did spot quite a few in their burrows, nesting away. Looking out through one of the shipwrecks. 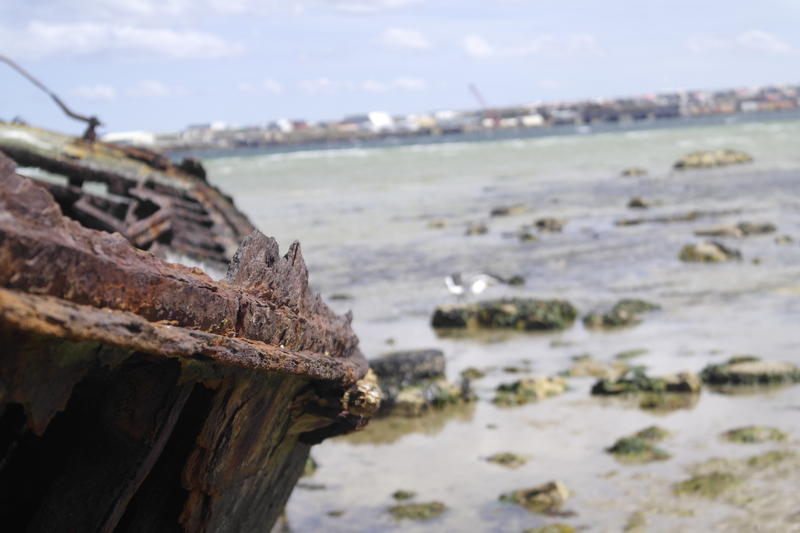 There are many shipwrecks in various states around the Falklands, both wooden and metal. A Falklands Thrush, apparently. No zoom needed, they’re quite friendly like the rest of the wildlife. Bailey getting closer to the Night-herons, with Cormorants nesting in the foreground. 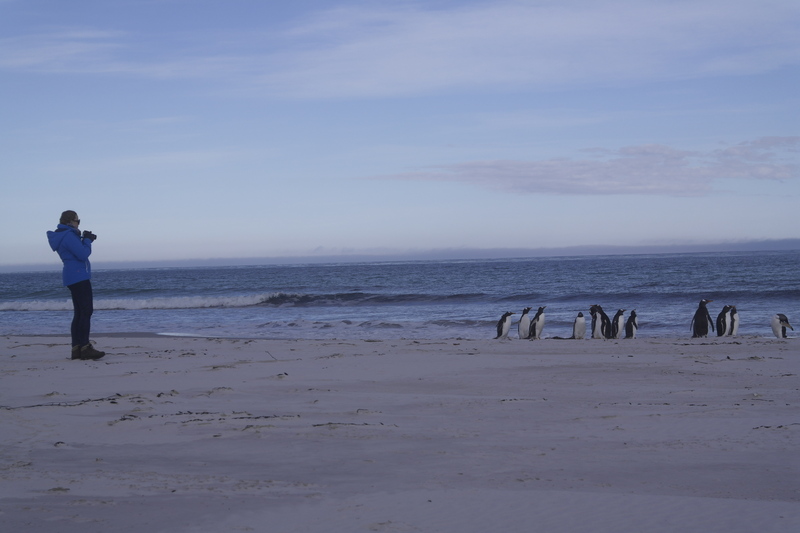 The gorgeous beach in the background is Yorke Bay, sadly littered with landmines and only accessible to the Magellanic penguins that inhabit it. The Internet – we pay £80 per month for 5gb of internet. Each mb over that costs you 6p. If you have an update to run or, say, your iPhone resets its settings and uploads everything to the cloud, you can run into trouble very quickly. Add the cost of international phone calls to the mix and I’ve been paying Sure, the comms company, about £200 per month. There are less measurable upsides to this too though. You really do realise how little you need to see, read and load most of the stuff online. 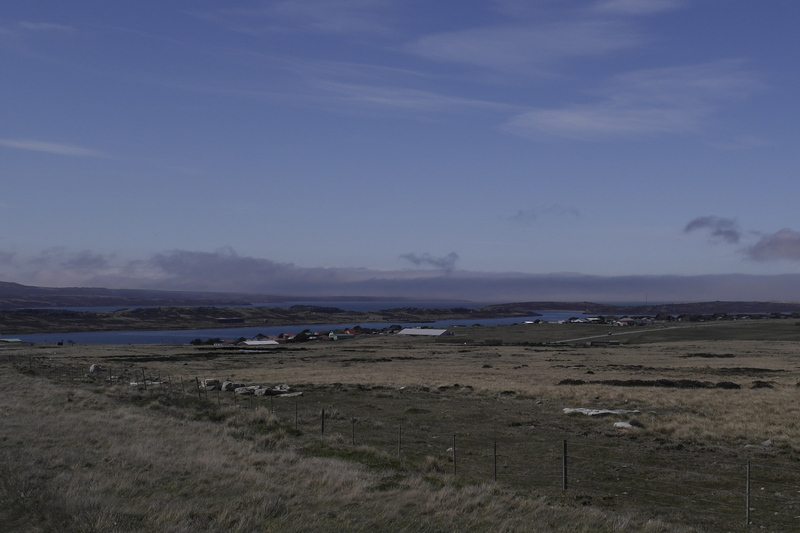 The Falklands assumptions – In a community where everyone knows everyone and everyone knows everywhere, when you ask someone for help, directions or information, everyone seems to assume that you know as much as they do and it can be very hard, especially in camp, to figure out what’s going on. Similarly, you find out about events by pure luck half the time. The pace – it is an easy-going life here but this can have its drawbacks. If you go shopping, expect it to take some time while they pack the bags one item at a time, people write their cheques out and if you want to get hold of something you’d better not be hoping to buy it between Midday and 1pm. Stanley is shut for the sacrosanct lunchtime (even the police station). The banking – Standard Chartered run the bank here. You need to be here 6 months before they’ll give you a debit card, there is no cash machine so you have to go into branch to get cash out, except they close at 3pm each day and the prolific use of cheques, combined with only being able to get your weekly statement when they send it to you makes it bloody hard to keep track of your spending. I’m sure there are many who would add a hell of a lot to that list, but for now that’s what I’ve found most frustrating. 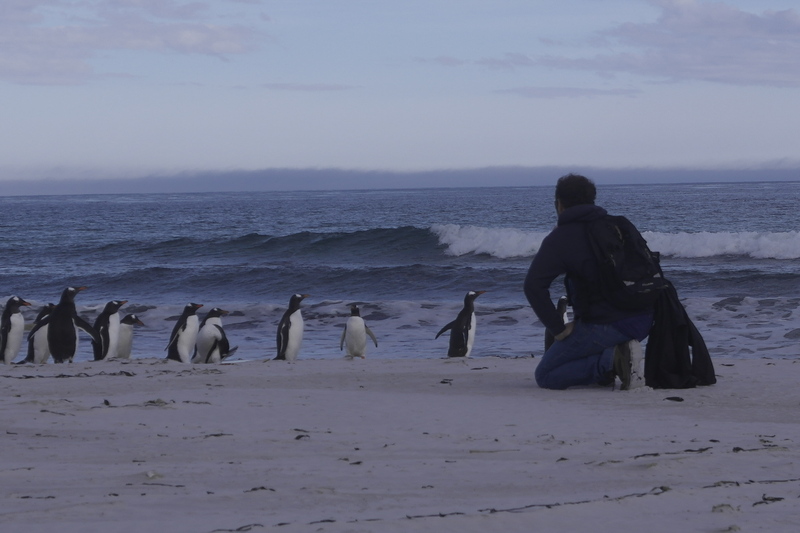 To counter this, the Falklands continues to provide its moments. In the last week we’ve had Remembrance Sunday in Stanley, our first cinema trip (oh yes!) and a walk from the Lady Liz around to Gypsy Cove today. Remembrance Sunday is a big deal here, not that there’s any knocking that. A parade made up of the various sections of the military and the FIDF (Falkland Islands Defence Force: a sort-of Army Reserve of Falkland Islanders) makes its way to the Cross of Sacrifice on the seafront, where the Governor appears with CBFSAI, emerging from their official vehicle (a Discovery with a gold crown on a black background as a registration plate – he is the Queen’s representative after all) and the ceremony ends with the military band, the firing of the Victory Guns to mark the silence and the units marching off. Our links with the military didn’t end there as we took a Sunday night trip to the Cinema at Mount Pleasant Airfield/MPA (the military complex). Civilians are allowed to access the amenities at MPA, 40 minutes’ gravel, pot-holed drive from Stanley, but you’re not in danger of forgetting it’s a base. The signs reminding you that the area comes under the Official Secrets Act, the guard ready to deny you entry without a password, the security badges with your photo on, the Rapier anti-aircraft missile sites, the bunkers etc etc do make it obvious. Once you’ve figured out which non-descript, unsigned door holds the NAAFI and cinema, you can go and sit in with the military boys for the bargain price of £4. Bond was OK, by the way. What you save in ticket price, you suffer for in having to drive home on the MPA road at night. A frightening but unavoidable prospect. We had planned a more exotic adventure this weekend but the wind picked up and we ended up doing our most local scenic walk. Head to the Lady Liz, walk around to Gypsy Cove and see Stanley through the Narrows of the harbour. 5 miles, lovely stuff. Always something to be seen, so we can’t complain. I’ve never been and never will be a twitcher but I like to know what I’m looking at so we’ve slowly been learning some of the Falklands wildlife. A nesting night-heron. Not crime-solving. I don’t know if it’s a good thing but I can now tell my Meadowlark from a Cormorant, my Karakara from an Upland Goose. Han’s taken some pretty great pictures this week and she’s got her log-in for the site so hopefully there’ll be a lot more to keep you interested appearing very soon. The Turkey Vulture; beautiful in flight, ugly once they land! I have to confess that a large part of me has been wanting Han to love it here, so we’ve been heading out to various places in the hope that she’ll see what I see in it all. 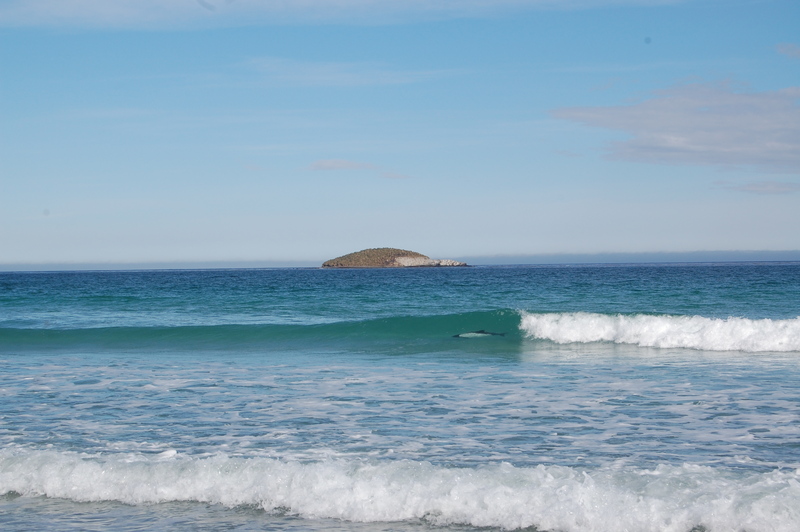 This means we might have less to report as weeks go on but in the mean-time…this weekend I planned a pretty busy Saturday; kayaking in the morning, with a day trip to Bertha’s Beach (named after a ship that wrecked there) on the South coast of the Falklands. I left all of my kayaking gear in the UK, wrongly assuming that there wouldn’t be the opportunity to paddle here but there are kayaks around. I was lucky enough to meet up with a colleague who had spare gear and boats so we took them down to ‘B Slip’ (a slipway in Stanley known for the over 1 million tonnes of cargo that was offloaded in the two years after the conflict). Stanley lies in a huge natural harbour with the iconic ‘Lady Liz’ rusted shipwreck, among others, at one end and the opening of the harbour (‘the Narrows’) opposite the town. After paddling to the Lady Liz, we looped around to the Narrows where I spotted a dolphin fin surfacing. Paddling over, we realised they were attracted to the paddling and the school of Commerson’s dolphins joined us to play in the harbour. I’ve paddled in some stunning places but today was something different: a sunny day with clear, still water and dolphins swimming under our boats and playing on at our bows, at times less than a metre from the boats. There is something about these Islands. I can’t put it in words any better. No waterproof camera, sorry. The thing is, this was only Saturday morning. The afternoon we drove out to Bertha’s Beach, miles of white sand, deceptively tropical-looking water and some rare sunshine to accompany us 90 minutes’ drive from Stanley. 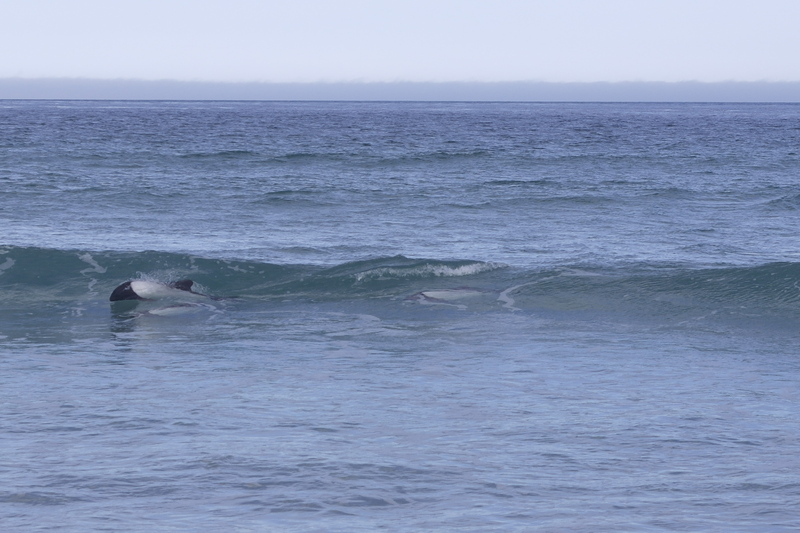 For the second time in one day, I spotted dolphin fins surfacing nearby to our location. Like us, they were following the length of the beach, surfing the waves in close to shore as they went so we chased them down the coast. I don’t know who was enjoying the day more. 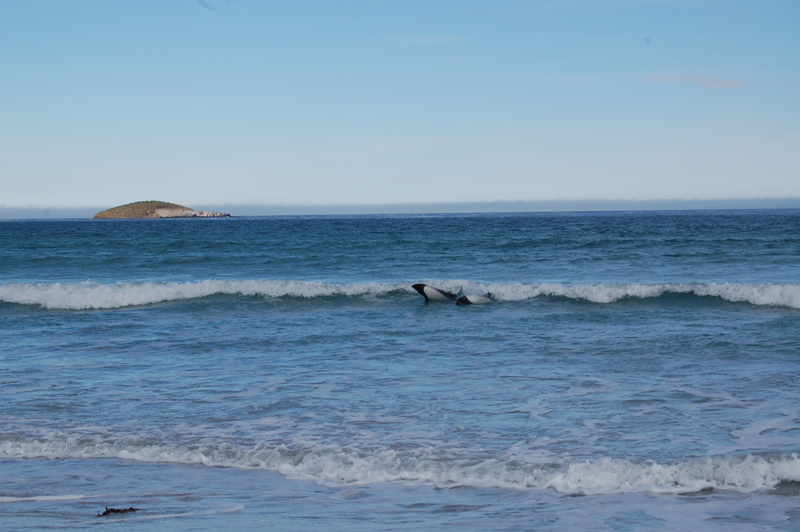 Commerson’s dolphins surfing at Bertha’s Beach, surfing in close to shore and following the tide down the beach, along with us. Unforgettable. 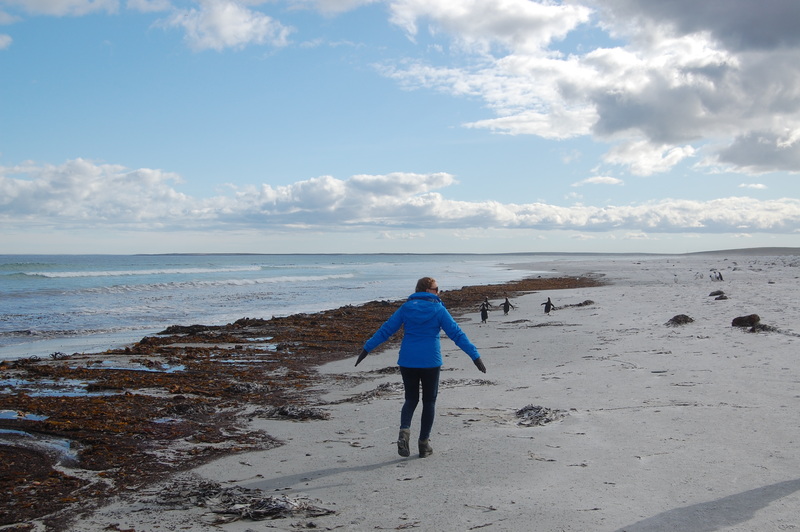 Bertha’s beach is also home to Gentoo penguins (and the occasional Sealion, breeding on the Island you can see in the distance) so we had a giggle at the ever-ridiculous attempts by penguins to walk too. There truly is something about these Islands.